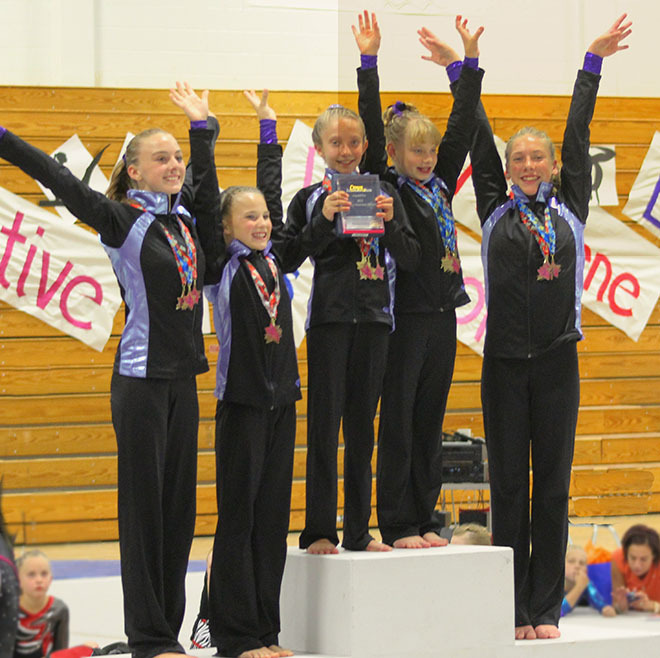 Premier Gymnastics of the Rockies hosted their first meet of the season on September 7 and 8. It was held at Loveland High School. The Level 3 team placed third. The Level 4 and 5 teams both placed first in the Team Competitions. In the All Around competition: For Level 3, in the Younger Division, Myah French placed fourth. In the Middle Division, Naima Contreras placed first with a score of 36.4, and Payton Rechkemmer placed third. For Level 4, in the Middle Division, Kylie Cook placed first with a score of 35.75, Hailey Sundby placed second and Taylor Evans placed third. In the Older Division, Mia Greeson placed first with a score of 37.55 and Dianna Ingersoll placed third. For Level 5, for the Younger Division, Abby Hazlett placed fourth. In the Middle Division, Madison Blair placed first with a score of 37.2 In the Older Division, Morgan Kenner placed first with a score of 35.425 and Brittani Myers placed second. Individual top 5 event finishers from Level 3 were: From the Younger Division, French placed third on Vault, and Brenna Rutherford tied for third on Vault. French placed fifth on Balance Beam, and Rutherford placed second on Uneven Bars. In the Middle Division, Contreras placed first on Vault, and Rechkemmer placed fourth on Vault. On Uneven Bars, Contreras placed third, Taryn Thompson placed second, Rechkemmer placed fifth, and Elizabeth Thompson tied for fifth. On Balance Beam, Contreras placed first, Carly Southhard placed fourth, and Rechkemmer tied for fifth. On Floor, Rechkemmer placed second, and Contreras placed third. In the Older Division, Ava Brunner placed fifth on Balance Beam, and Lily Eklund placed fourth on Uneven Bars. Level 4 top 5 event finishers are: In the Middle Division, on Vault, Cook placed second, Evans tied for second and Sundby placed fifth. On Uneven Bars, Cook placed first, Sundby placed third and Evans placed fourth. On Balance Beam, Cook placed first, Sundby placed second and Evans placed fifth. On Floor, Sundby placed first, Cook placed second, and Evans placed fifth. In the Older Division, on Vault, Greeson placed first and Ingersoll placed fourth. On Uneven Bars and Balance Beam, Greeson placed first. On Floor, Greeson placed first, and Ingersoll placed fourth. Level 5 top 5 finishers are: In the Younger Division, Hazlett placed second on Vault and Uneven Bars, and third on Balance Beam. In the Middle Division, on Vault and Uneven Bars, Blair placed second. On Balance Beam and Floor, Blair placed first. In the Older Division, on Vault, Kenner placed first and Myers placed second. On the Uneven Bars, Myers placed first and Kenner placed second. On Balance Beam, Kenner placed second and Myers placed fifth. On Floor, Myers placed first and Kenner placed fourth.